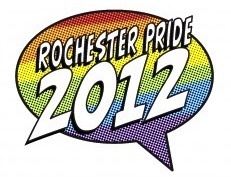 Join us at Rochester Pride in July! SBAI will be walking with the University of Rochester in this year’s Pride Parade on July 14th to celebrate Rochester Pride! The parade runs from 3:30pm to 5pm.We hope you will join us in walking to show our support and celebrate the LGBTQI and Allies Community. Over 40 participants from the University walked in last year’s parade, and University organizers hope to double that number this year! Parade line-up on July 14th is between 2:30pm-3:30pm on both Argyle Street and Brunswick Street, between East Avenue and Park Avenue (we’ll have an exact location soon). The parade route will follow Park Avenue to Goodman Street to College Avenue. You are asked to wear University of Rochester-related clothing, if possible. Notable parade participants this year include Rocky (the University of Rochester mascot) and Paul Burgett. The parade theme is Pride Power: Superheroes. If you want more information or would like to join SBAI in walking in the parade, please send an email to sbai@rochester.edu (or, just show up and look for the blue and yellow!). This entry was posted in Community and tagged #comingout, #LGBTQI, #pride. Bookmark the permalink. 2 Responses to Join us at Rochester Pride in July! Really glad to being seeing this kind of change in an educational institution where it it so hard for most people to fit it. Right on! Thanks, Joanna! We’re working every day to make our spaces more inclusive, open, and welcome here for EVERY person.The parade was a blast, and it was so nice to have Vice President Burgett walking with us.